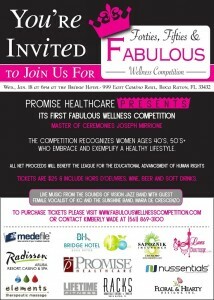 In support of its corporate and community wellness initiatives, Boca Raton-based Promise Healthcare is presenting a Women’s “40s, 50s, & Fabulous” Wellness Competition that will culminate with ten finalists vying at a runway competition followed by a celebratory reception at Carmen’s At The Top Of The Bridge Hotel on Wednesday, January 18, 2011 at 6 p.m. The event and reception is open-to-the-public and will benefit the League for Education and Awareness of Human Rights. Held to increase awareness of the benefits of incorporating wellness into a woman’s daily activities and recognize women in Promise’s home community ages 40 and above who embrace and exemplify a healthy and fit life and style, the competition begins with online registration followed by one-on-one interviews that narrow down the field to the final ten to hit the runway at the Bridge Hotel. 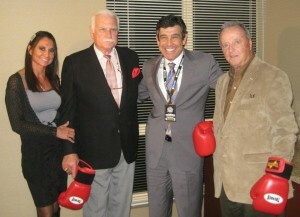 The event is part of the upcoming The Battle of Florida festivities that will lead up to the collegiate football all-star championship game to be coached by awarding-winning football legends Bobby Bowden (for the north team) and Howard Schnellenberger (for the south team) at the new Florida Atlantic University Stadium on Saturday evening, January 21, 2011. According to Promise Healthcare’s Women’s “40s, 50s & Fabulous” Wellness Competition Executive Director Carmel Pasquale, qualifying candidates will be interviewed with the ten finalists notified. Finalists will then hit the runway at the Friday, January 18th reception in both fitness attire and with dresses provided by LUCX Boutique, and be asked to share 1) why they place priority on wellness, and 2) their secrets to achieving a well-balanced life and style. All finalists will receive prizes for their participation; the first place winner will become a Promise Healthcare ambassador of well-being locally and in its Promise hospital markets, and enjoy a three-night vacation getaway for two at the Radisson Aruba Resort, Casino & Spa on the island’s largest stretch of pristine Palm Beach, including airfare. Pasquale’s passion for fitness stems from her experience as a lifelong athlete who grew up participating in all levels of sports including basketball, lacrosse, track and field, etc. She utilized the dedication she had as an athlete to pursue a career in modeling and later as the owner of health clubs, spas and beauty salons. While raising her two now-grown boys, her focus was always on health and nutrition that motivated her to become formally trained and educated as a top chef focusing on diet and nutrition. Pasquale has now turned her passions into an overall fitness program for Promise Healthcare to help women develop their mind, body and spirit. Event sponsors include Promise Healthcare (presenting sponsor); Radisson Aruba Resort, Casino & Spa; Life Time Fitness; Boca Raton Bridge Hotel; Jody Jack & Co. Hair Salon; MedeFile International, Inc.; LUCX Boutique; Nussentials/JBK Naturals; Weiss, Handler, Angelos & Cornwell, P.A. ; Gary Rack Restaurant Management Group; Sapoznik Insurance and Joseph Mirrione. Tickets are $25 per person; reception will include hors d’oeuvres, wine, beer, and soft drinks. 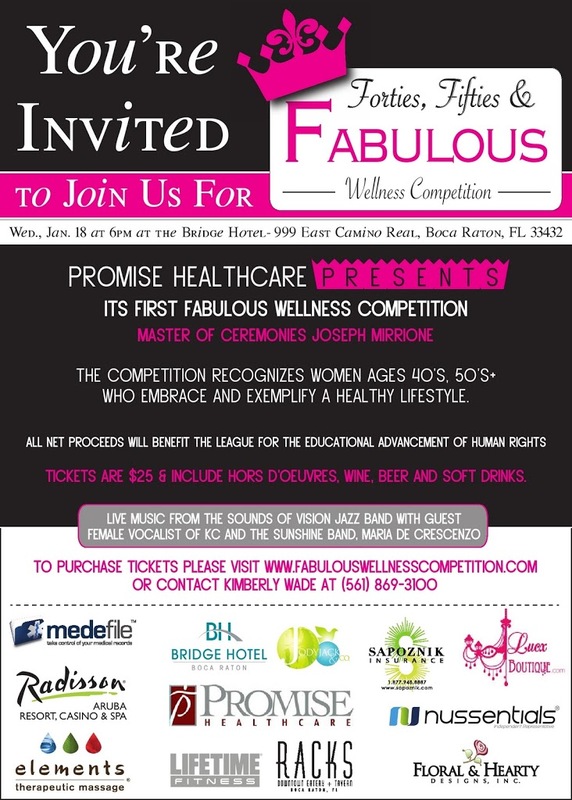 For more information, and to register to participate or purchase tickets to Promise Healthcare’s Women’s “40s, 50s, & Fabulous” Wellness Competition, visit www.fabulouswellnesscompetition.com or call Kim Wade at Promise Healthcare, Inc. at (561) 869-3100. For more information on Promise Healthcare, visit www.promisehealthcare.com.